If you have an ancestor who arrived in the Unites States through the Port of New York City, you can gain very valuable family history information by looking at New York passenger lists. What Is a Passenger List? Much of the American population is composed of immigrants. A majority of those immigrants arrived in the United States through one of the seaports along the Atlantic coast. Ship captains and immigration officials kept lists of people who disembarked the ships for the new country. You can use these lists to find helpful information for your files. In 1614, the first European immigrants arrived in the area now known as New York City. 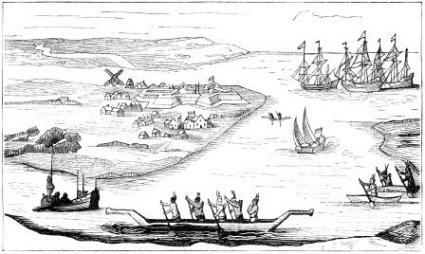 At the time, New York was called "New Amsterdam," and the city was a Dutch fur trading center. By 1664, the English had claimed the area and renamed it "New York." Over the following centuries, several waves of immigrants moved into the area. During the 19th century, Irish immigrants alone made up a quarter of the city's population. Millions of Americans can trace their ancestry back to someone who entered the country through the Port of New York. It can be tricky to find immigration records for New Amsterdam and early New York, but several sites offer limited passenger lists. It's a bit easier to find records after 1855 when Castle Garden became the primary immigrant processing center for the port. Although some of the Castle Garden records were destroyed in a fire, many remain and are searchable online. If your ancestors arrived later in the history of New York, you'll be able to find a wealth of information from the processing center at Ellis Island. Olive Tree Genealogy is a great free resource for online research, and one of the site's specialties is passenger lists. Here, you'll find ships' lists for vessels sailing too and from New Amsterdam in the 1620s through the 1660s. You'll also find New York City lists for the 17th, 18th, and early 19th centuries. In addition to the ships arriving in the Port of New York, the Olive Tree Genealogy site includes information about some of the ships leaving New York for other American and Canadian ports. Although it requires a paid subscription, Ancestry.com has searchable records for hundreds of New York ships. The service is easy to use and offers lots of helpful features for finding your ancestors. You can also get a free two-week trial membership if you have not been an Ancestry member in the past. If your ancestors arrived in New York between 1855 and 1892, you may be able to find them on a passenger list from Castle Garden. CastleGarden.org is a free searchable database of many of the remaining records from this period. Researchers are constantly adding more records to the online files. If you can't find what you need now, you may find it later. The most complete passenger lists are from the Ellis Island immigration period, which lasted from 1892 to 1954. You'll find detailed information about the health and literacy level of the immigrants, and almost all Ellis Island records are available online. Although first and second class passengers often went through Customs without having to step foot on Ellis Island, their ship records are usually included on the Ellis Island databases. Check variations on the spelling of your ancestors' names. Many immigrants were illiterate, and ships' captains and immigration officials also frequently misspelled names. It helps to have a vague idea of when your ancestors arrived in New York. Often, you'll need this information to know you're looking at the correct passenger list. If you can find out the name of the ship on which your ancestors arrived, you'll have even more luck finding the appropriate passenger lists. It can be challenging to find the right passenger list. Check several locations online, and don't get discouraged. New information is added all the time. If you check back at a later date, the list you need may be available.